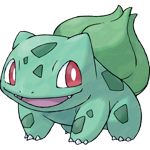 Bulbasaur is the first Pokemon on the National Pokedex and was featured alongside Charmander and Squirtle as the starter Pokemon for Blue, Red, Green, FireRed, and LeafGreen versions. 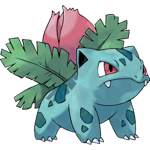 Bulbasaur is a Grass/Poison type Pokemon. 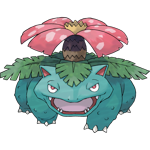 It evolves into Ivysaur at level 16 and again into Venusaur at level 32.